Standard Pallet rack dimensions for the columns are 3” x 3”. The three different styles of beams that are offered are: light duty, and the rated capacity for light duty beams is 3,973, step; rated capacity ranges from 5,000 lbs, 4,600 lbs, 5,692 lbs , and 5,710 lbs and lastly we have the nosed beam which has a rated capacity of 6,300 lbs. The lengths of the beams vary from 96”, 108”, 120”, and 144”. The beams can be adjusted every half inch so the height of each level can be adjusted. NationWide Shelving can help you choose the right sizes and capacity for your needs. 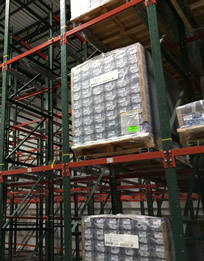 Many additional products can be purchased with the pallet rack to give you the most of your unit. Row spacers are commonly bought accessories for pallet rack. Row spacers are placed in between units to create a space between them so beams are not damaged or chipped by rubbing on each other. Pallet Supports are bought to help support pallets and give extra strength to the unit. They are placed on top of the beam and sit in line with each other creating additional pallet support. Column protectors are also commonly bought with this unit. What this accessory does is prevents any damage that could be done to columns during use. This also gives your unit the protection to keep it looking new and preventing any wearing down on the unit columns. Wire decking is also an option when looking at this unit and wire decking for smaller sized product. Pallet Racks are a great way to store large bulk loads of products as well as create a clean and organized space for items. Organization labels can be made and placed on unit to find what you’re looking for much easier. 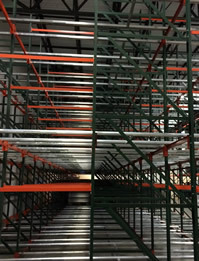 Pallet racks are also built as large structures therefore providing and allowing more product and inventory to be placed. Give NationWide Shelving a call today and find the perfect pallet rack for you!